Ava is a true girly-girl. She loves shopping and wearing the latest fashions. And she of course knows that accessories make the outfit. Despite what Larry says, there's no such thing as a bow that's too big. 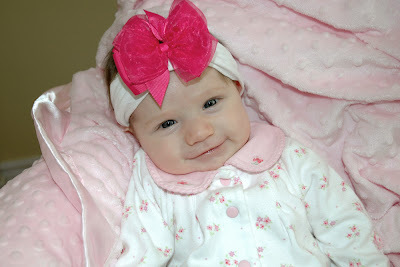 Plus, the weight of the bow is helping to strengthen her neck muscles. I keep thinking that she can't get any cuter, and then you post these new pictures--cuter than ever! She is just so adorable. 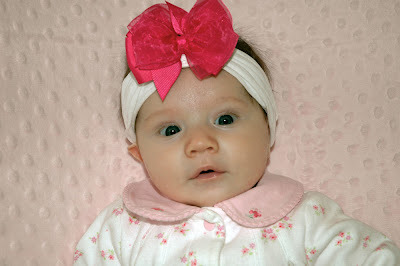 Oh my...she is so darn cute :) The accessories are adorable as well!!! 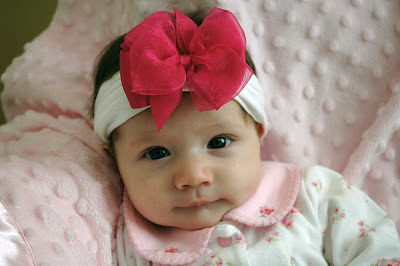 Looks like the bow doesn't just strengthen her neck muscles...but opens her eyes a LOT wider!! Too cute!!! I really need to know where you you get your headbands. They are so cute. Poor Cecily ends up with the same little walmart bows every day. Boring. I like that smile in the middle picture!